Ch-ch-ch-changes. Monsters are not always stationary, never-changing evil. They can be made, they can be unmade, and they can be remade. Sometimes their changes are just a shift in perspective on the part of the reader/viewer. Fascinating stuff! For example, take a look at the Beast in Disney’s Beauty and the Beast. In the prologue, he is a physically handsome man with a bratty, spoiled soul. He’s mean to an old lady, and in the best fairy-tale tradition, she turns him into a beast until he’s learned the error of his ways. I love that – the bully is punished, but he’s got a way to redeem himself, if only he can figure out why he was wrong and he can take steps to change things. This is his first transformation, which is a physical one. So, he grumps around in his castle for a very long unspecified period of time, then Belle comes into his life, and slowly transforms his soul. He becomes a better man, and he falls in love (and not necessarily in that order). Belle accepts him for his kind actions, and doesn’t mind his rough exterior. (Although, it would be quite a lesson indeed if the Beast could have fallen for a dowdy little librarian and learned to become a better man. But, I suppose that would have been a different story.) Not only that, he becomes good enough of a man to win her love. This is his second transformation, and it is an inner transformation of mind and spirit. This is the task he was entrusted with, the lesson to be learned. Finally, true love’s kiss transforms him from a beast into a beauty again. Initially, Belle is a bit suspicious about this handsome stranger, but his eyes prove that he’s really the Beast she fell in love with. Awwww! Happy ending, Disney wedding, hoorah, hooray! This third transformation is physical, and the reward for his completing his task. We can hope he learned his lesson, as well. From the same movie, we see that Gaston is a handsome bully. Belle (and we, the viewers) soon see through his beautiful exterior into the evil selfishness beneath. No old woman forces him through a transformation, and he dies during his task/lesson. Looking at another Disney movie, we can see another handsome monster in Frozen. Cracked.com had a good article on how Prince Hans manages to keep his monstrous identity a secret until near the end. Cracked argues that Prince Hans is a victim to the magic of certain other characters, and he’s not a monster of his own free will. If this is true, it’s an example of a bad mishandling of monster transformation. Transformation should be strenuous. If it’s physical, there should be effort and rips and pain. If it’s mental or spiritual, it should also be painful. It should also be hard-won goodness, or hard-lost evilness, as the case may be. No one should flip on the magic and say, “OK, you’re a bad guy now.” Or vice versa. That’s why I think the standard reading of the Disney film stands. Prince Hans was a monster inside, full of pure selfishness. He was defeated because he could not transform himself. Elsa, on the other hand, never quite becomes a monster although she is viewed as one. When she stops refusing her power and learns to use it with control (instead of just suppressing it), she transforms from dangerous to powerful. How about you? 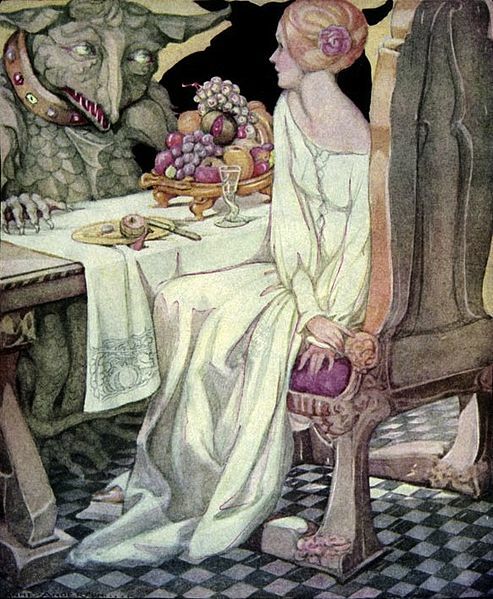 Do you have any favorite stories where the monster turns good, or the hero/heroine turns bad? This entry was posted in Character and tagged Beauty and the Beast, belle, Elsa, evil to good, frozen, good to evil, Michaeline Duskova, monster transformations, Prince Hans, redemption of a monster. Bookmark the permalink. ← Elizabeth: Friday Writing Sprints – Let’s Vote On It. I loved the whole Buffy series. Angel starts as a monster but is reformed through love, but then turns into a monster again and is reformed again. Spike starts out as a monster, too, although his love for Drusilla is strong, and he spends his story arc struggling to be a person Buffy could love. And Faith starts off pretty good but goes really bad. Love those guys. IIRC, Buffy started out as a bit of a monster (well, super-brat). I saw either the movie or read the book (? ); I definitely remember the soundtrack album! Anyway, I sort of made up my own Buffy in my head reading the blurb and liner notes, and nothing really lived up to her. I think power transformed her from a brat into a responsible person. Or I could be making all this up . . . it’s been such a long time. I love that Angel had relapses. Spike could be the kind of monster I’m looking to model my monster after. His transformation was all “power of love”, wasn’t it? Very gradual, IIRC. From my viewpoint and with my filters, “Transforming one’s character for love” is a very male thing to do. I can’t really think of many characters who transform their characters to win a man’s love. Usually, women characters start off with a “great personality” and wind up changing their outer appearance to catch the man’s interest. Possibly Emma (by Jane Austen) transforms her character to be worthy of love. Mr. Darcy does his best to transform his character to be worthy of love, too. Hmmmm.